"If we looked at mortality as the whole of existence, then pain, sorrow, failure, and short life would be calamity. But if we look upon life as an eternal thing stretching far into the premortal past and on into the eternal post-death future, then all happenings may be put in proper perspective. "Is there not wisdom in his giving us trials that we might rise above them, responsibilities that we might achieve, work to harden our muscles, sorrows to try our souls? Are we not exposed to temptations to test our strength, sickness that we might learn patience, death that we might be immortalized and glorified? "If all the sick for whom we pray were healed, if all the righteous were protected and the wicked destroyed, the whole program of the Father would be annulled and the basic principle of the gospel, free agency, would be ended. No man would have to live by faith. "If joy and peace and rewards were instantaneously given the doer of good, there could be no evil—all would do good but not because of the rightness of doing good. There would be no test of strength, no development of character, no growth of powers, no free agency, only satanic controls. "Should all prayers be immediately answered according to our selfish desires and our limited understanding, then there would be little or no suffering, sorrow, disappointment, or even death, and if these were not, there would also be no joy, success, resurrection, nor eternal life and godhood. And sanctify to thee thy deepest distress.' [See Hymns, no. 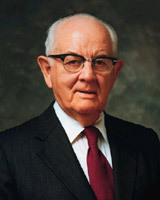 5]"
In this wonderful, memorable address, President Kimball considered the classic problem of evil in the world. Why does a loving God allow so much suffering and sorrow to exist? The deeply thoughtful answers President Kimball offers give a powerful perspective on our mortal experience that can bless us as we struggle through times of challenge, disappointment, or pain. A critical part of the answer lies in understanding the eternal duration of our lives, from pre-existence to an everlasting future. The experiences of this life are a part of the training and schooling required to prepare us for the eternities, and we entered this life with full awareness of the coming struggles. We accepted a plan that included the requirement of "free agency" for each individual, allowing us to grow and progress as we learned to make correct choices. But if every prayer were granted immediately and all suffering relieved, how different life would be! We would lose the chance to grow through the trials, to learn the lessons that a mortal experience teaches. "Suffering can make saints of people"—can, if they learn to respond with the perspective of eternity and with faith in God's wisdom and support. Truly, God may call us to pass through "deep waters;" but He promises to "sanctify to thee thy deepest distress" and those struggles can become holy. Incidentally, it's wonderful to listen to the recording linked above (at the end of the quote), and hear President Kimball's beautiful, strong voice share the remarks. 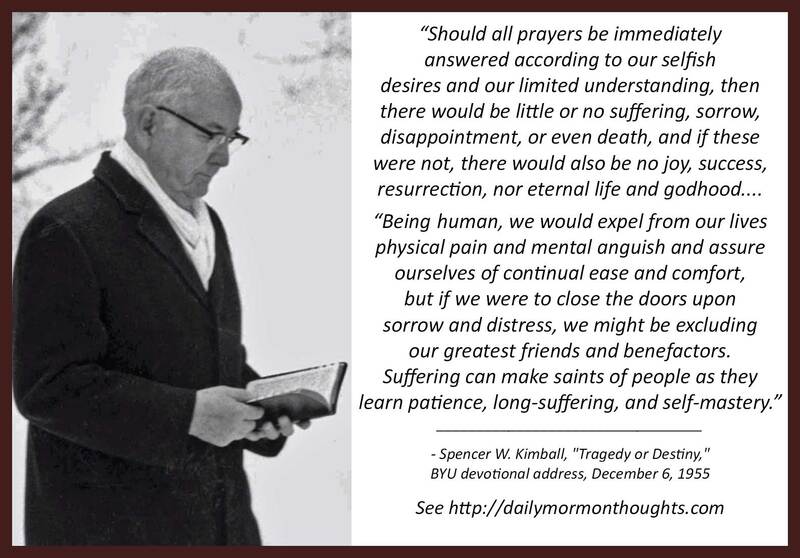 Within 2 years of giving this address, cancer of the throat would require the removal of most of President Kimball's vocal cords, leaving him with the harsh, gravelly, whispered voice that the Saints would come to love as a sign of his own patient endurance of trials and suffering. I love everything you write. I devour every word of what the prophets say and what you add to it. I am amazed at how you seem to know exactly what I need to hear on any given day. Thank you for bringing these quotes and teachings and your thoughtful insights to our minds, and please never stop sharing!